As tuition rates spiral beyond reach and student loan debt passes $1 trillion (more than credit card debt), IVORY TOWER asks: Is college worth the cost? From the halls of Harvard, to public colleges in financial crisis, to Silicon Valley, filmmaker Andrew Rossi (PAGE ONE: INSIDE THE NEW YORK TIMES) assembles an urgent portrait of a great American institution at the breaking point. 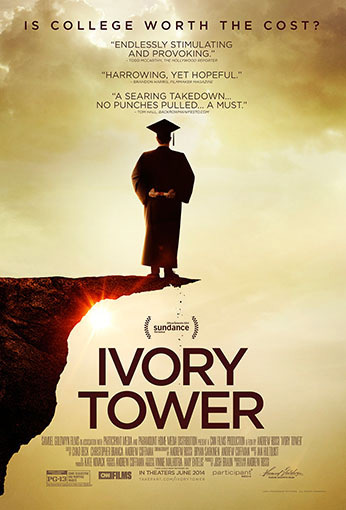 Through interview profiles at Arizona State, Cooper Union, and Sebastian Thrun’s Udacity – among several others – IVORY TOWER reveals how colleges in the United States, long regarded as leaders in higher education, came o embrace a business model that often promotes expansion over quality learning. But along the way we also find unique programs, from Stanford to the free desert school Deep Springs to the historically black all women’s college Spelman, where the potential for life-changing college experiences endure. Ultimately, IVORY TOWER asks, What price will society pay if higher education cannon revolutionize college as we know it and evolve a sustainable economic model?